Matt's Mom sent us a recipe for freezer pickles to help us use up all the cucumber we've gotten from our CSA (I still had 5 huge ones in the fridge). The nice thing about freezer pickles is Matt will be able to have homemade pickles as a snack long after the cucumbers are out of season. He's been known to eat a jar of my refrigerator pickles in one sitting. 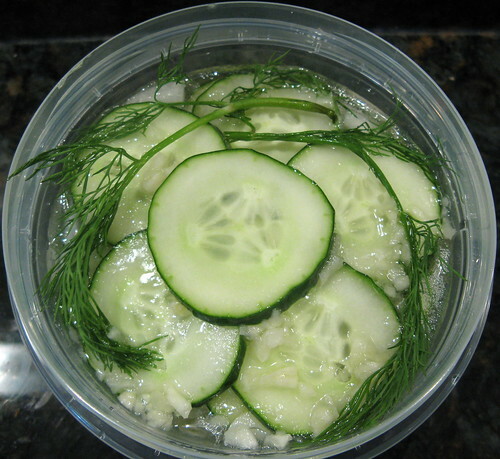 This recipe makes a garlic dill pickle which is something Matt had been asking for as well. The recipe calls for the pickles to be frozen in two 1-quart freezer containers. We decided to use four 2-cup containers so we could just thaw a little at a time when we wanted them. Its a super simple recipe with the only time consuming thing being the slicing. I can't wait to thaw some out & see how they taste. Knowing how good a cook Matt's mom is I bet they'll be great. Layer the cucumbers & onions in freezer containers. Whisk together the oil, vinegar, salt, honey, water & garlic until well combined. Pour over the cucumbers & onions leaving about 1 inch of headroom (it will expand when it freezes). Top with the sprigs of dill. Cover & freeze. Update 10/1: Here's how the pickles turned out. How long do they have to freeze for before you can thaw them? 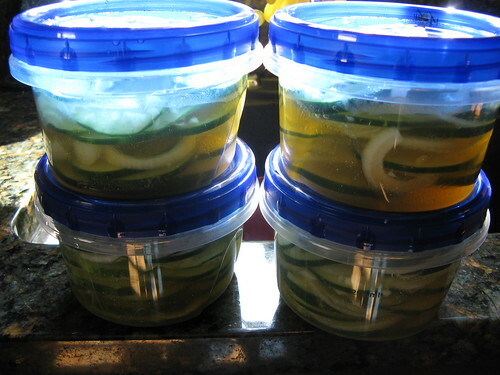 Anon - The recipe we used didn't specify but I would assume like refrigerator pickles 36 hours would be enough time. Freezer pickles: what a cool idea. . .pardon my ignorance but I've never heard of freezer pickles prior to this recipe. Now that I know, I know this is a fantastic thing. Thanks! I never knew you could do this! So do they stay crunchy when you thaw them like a normal pickle? This is genius! I had no idea. Thanks for sharing, I look forward to hearing how the turn out. I dunno. I can't imagine cucumbers freezing well and the flavor can't develop while the brine is frozen. Do please post again when you defrost a batch; I'd quite like to see the results. I've never thought to freeze cucumbers to make pickles. I'll wait to see how yours turn out before I try it, but I'm open to new adventures. BTW, you've won an award. Come on over and see what it is. Hint: It doesn't have anything to do with pickles. 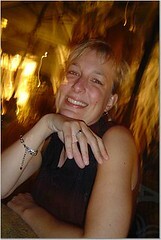 Just found your blog the other day- I love it! We live in La Crosse, Wisconsin- just a few hours south of you (and pretty close to Viroqua, where your CSA boxes come from!) Browsing through the past posts, I noticed that you once drove Radiohead around Minneapolis- how in the heck did you manage that! My husband is a huge Radiohead fan, and is completely jealous! Anyway, I look forward to many more posts and delicious looking food! Thanks!